The x236 ships with a default (6) Bay U320 Hot-Swap SCSI backplane. 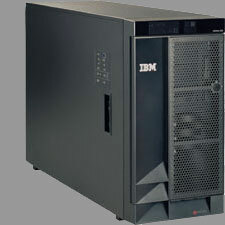 An optional (3) bay add-on backplane can be installed to support up to (9) 300GB 10K U320 disk modules. Systems shipped with an integrated Adaptec 7902 SCSI controller which offers CPU based RAID 1 and RAID 0 support across the (9) disk bays. An optional ServeRAID upgrade will enable RAID 5 support (among other levels) and will off load RAID calculation from the CPU. External storage in an EXP400 expansion array can be used with the ServeRAID controller.